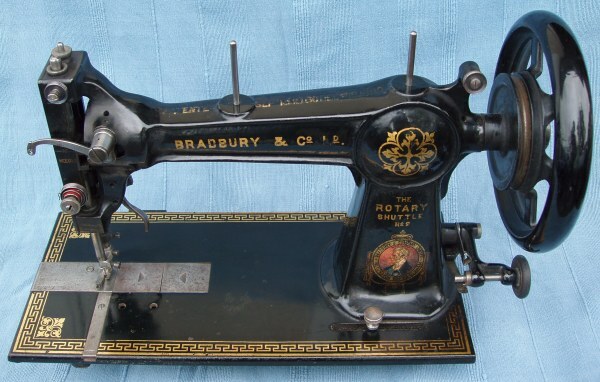 For information about the history of the Rotary machine click on the title above. All material copyright David G. Best 2002 - 2009 & 2015 All Rights Reserved. This semi industrial machine can be dated to c1886, as barely visible on top of the arm is the Patent date Dec 18th 1882 and the casting of the machine was completely revised by 1887, the machine then became known as the B2. Although heavily worn the decals are reminiscent of the Greek Key Pattern. The Company's Trade Mark appears on the pillar & the Company name as Bradbury & Co Ld on the arm. Note the shaped table, this model has a small drawer and the typical Bradbury cover which has a wooden swivel to hold it in position. The stand is an improved version of an earlier design with the pitman attached to the fly wheel via a cranked shaft rather than directly driven as on earlier Bradbury machines. A slightly later example which is in better condition. It has two patent dates on top of the arm, Sept 13th 1880 and Dec 18th 1882, these were omitted on later versions (possibly after 1900). The machine bears the "Dukes Head" Trade Mark on the base of the pillar. This is a later example and dates to around 1894. It has the smoother more rounded shape introduced c1887 and is designated as the B2. It has two patent dates on top of the arm, Sept 13th 1880 and Dec 18th 1882, with the "Dukes Head" Trade Mark on the base of the pillar. This example has a coffin cover and four drawers - note there is no centre drawer. 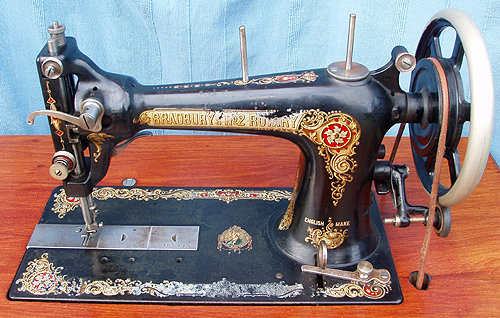 The machine is in outstanding condition with mimimal wear to the decals. 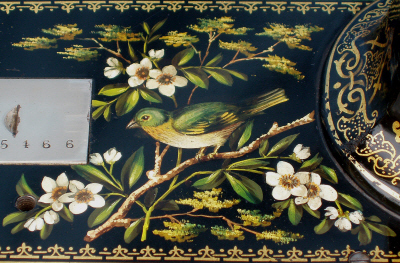 What makes this machine particularly special is the beautifully painted bed featuring flowers and what we believe is a Greenfinch. This machine can be dated to between 1894 and 1897. It has the same two patent dates on top of the arm as the previous machine. The machine bears the "Dukes Head" Trade Mark on the base of the shoulder. 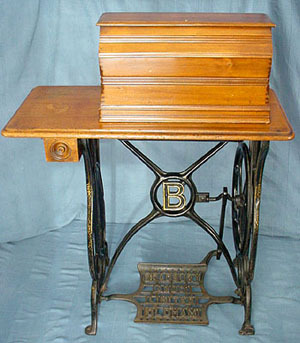 Most B2's seem to have a coffin cover as shown on the previous example, this particular machine has a lidded type which as far as we can ascertain is original. It is similar to that found on the earlier No. 2 Rotary machines. Note the small accessory drawer and curved edge to the table. 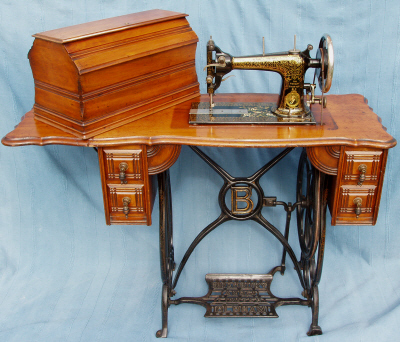 Some machines have two drawers on the opposite side with a straight edged table and flap, there was also a four drawer version as shown above. The stand has a large "B" in the cross brace and the pedal has "Bradbury and Co (Limited) Oldham" cast into it. 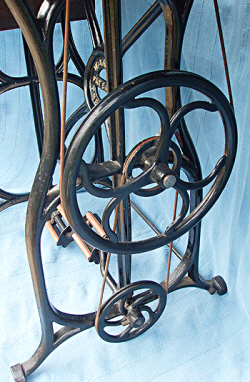 The stand was revised in the early 1900's with "Bradbury" in the cross brace and a plain pedal. This machine is perhaps a year or so later than the above example and has the same decals. It is in better condition and came with an original manual which although the front and back covers are missing has a last Medal date of 1886. 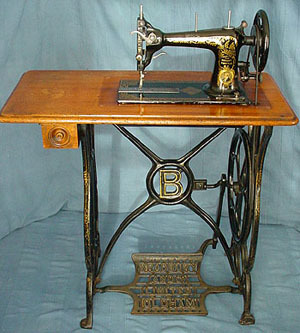 The bobbin on the Rotary B2 is housed under the central slide plate the right hand part of which presses down and slides to the right under the bed of the machine. This example has a straight table with small drawer. The lid is the more commonly found coffin type. The key fits in the top and operates a wooden swivel which locks under the arm. 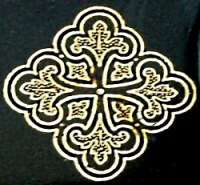 The stand has decals on the sides which have survived remarkably well as has the large gold painted "B" in the cross brace. This machine was very kindly donated by Fiona Walshaw and seems to have spent its life in and around the Dewsbury area of Yorkshire. 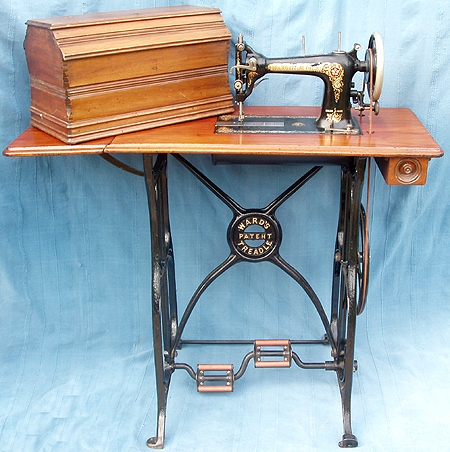 This is a later Rotary machine and although the head is worn this example is special as it is fitted to a Ward's Patent treadle stand which used a cycling action instead of the usual treadle. 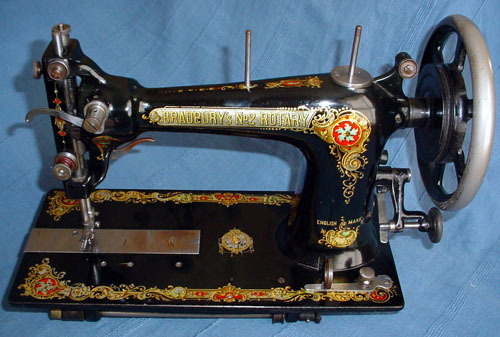 The decals on this machine are more colourful than earlier ones and it is without the Patent dates on top of the arm. 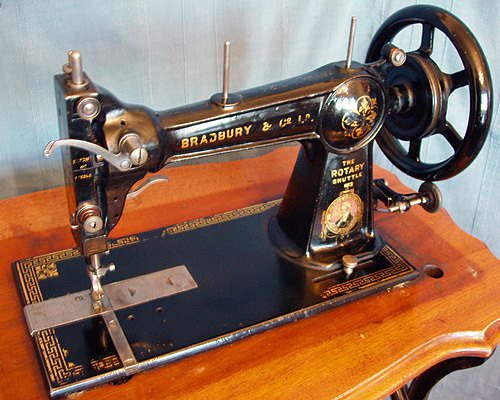 The machine has been redesignated Bradbury's No.2 Rotary and this example dates to c1900. The table has straight edges with a flap, there is a small drawer and "coffin" cover with lock in the top. 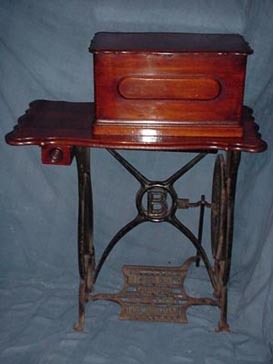 The Ward treadle stand was first introduced around 1884 and although it was made for many years only a few examples are known to have survived. 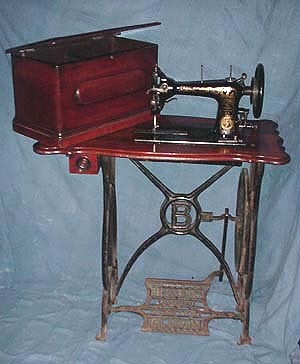 The stand was patented by Ward's Rotary Sewing Machine Treadle Co. 37 West 14th Street, New York and Bradbury & Co. were the company's agents in Great Britain. The stand could be supplied to fit most Bradbury machines but it was particularly used on the Rotary Shuttle. The pedals turn the small wheel which drives the larger fly wheel which in turn powers the machine it is effectively a form of gearing. This stand has lost all it's decals however the black Jappaning is in excellent condition. An Easy, Graceful, and Natural Motion. 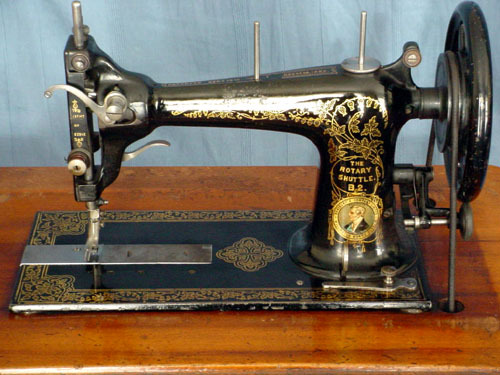 The usual speed of all Sewing Machines greatly increased with less expenditure of physical force. It will be seen that the action is Rotary there can be no dead centres, so that the Machine may be started or stopped instantly, without it being necessary to take the hands from the work, thus giving absolute control over the needle, and a smooth, easy motion. It can be applied to any of Bradbury & Co's Rotary Shuttle Machines, or their Family and Medium Machines at an additional cost of �1 including a suitable well made stool." A later version of the above machine but with better condition decals, the 'Duke' is on the Bed of the machine and the name on the arm. It fits a drop down cabinet with four drawers which have tear drop pulls. 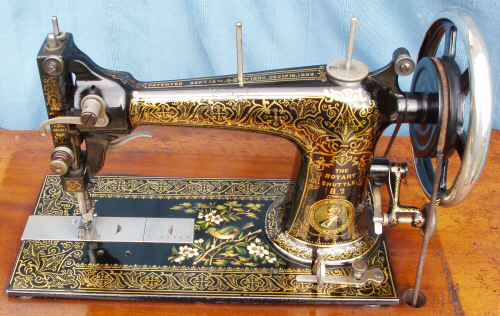 This particular model was mentioned in a 1905 catalogue priced at �11 10s. 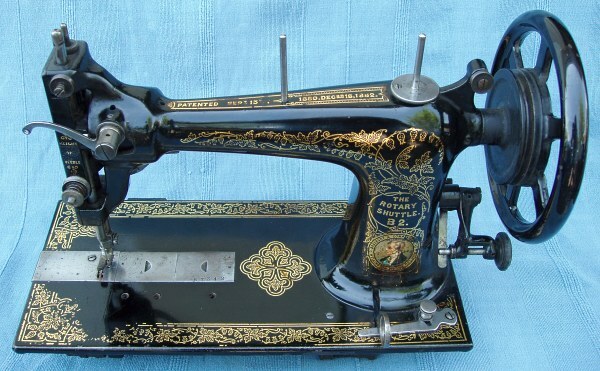 This machine was apparently given as a 21st Birthday present in 1903 and remained in the same family, it came with its original manual and a service receipt dated 31st March 1950.